James Christopher Desmoulin is currently enrolled in the MBA(FS) program and is looking forward to graduating in the Class of 2019. In a recent virtual interview with CEGE Connection, James reflected on how his academic journey influenced his work with Indigenous Services Canada and his position as a Union President in the Public Services Alliance of Canada. I always wanted to complete an MBA. Finding the optimum time was critical because I wanted to focus my efforts on my studies. It is important for me to apply and integrate the knowledge I acquire because I believe that business it not just about business. I find business is more and more about connecting with people and looking for ways in which to support efforts to achieve individual, as well as, collective goals. It is about building compassionate communities. In March 2018, I was invited to participate in a delegation to Guatemala arranged through the Public Services Alliance of Canada (PSAC). Our two-week mission was in association with Education in Action (EIA), an organization dedicated to improving the livelihoods of Mayan campesinos in Guatemala through initiatives based on social justice and fair trade. We worked with coffee producers through targeted field projects to facilitate the sales of fair trade organic coffee in Canada. We were guided by the EIA’s commitment to learn through cultural immersion and community outreach, in the spirit of partnership and respect for Mayan indigenous peoples. Education in Action is dedicated to strengthening communities. This remarkable organization supports the Comite Campesino del Altiplano (CCDA) education programs, its fair-trade coffee “Café Justica”, teacher’s salaries, its medical centre in Quixaya, San Lucas Toliman, Solola which is situated within the Guatemalan highlands to the east of Lake Atitlan. This assignment was a profound learning experience. I saw first-hand the daily challenges faced by the Mayan people, most of whom are farmers. Regrettably, the Government of Guatemala offers little assistance in the support of the indigenous Mayan. I had the opportunity to attend discussions where various Mayan community leaders spoke of the difficulties encountered with respect to land appropriation for mining. Mining interests, including Canadian mining companies, have encroached on the traditional lands used by Mayans for farming and supporting families and communities. Land appropriation has created human rights issues and court challenges on ownership. Who has the rights and title to the land, including mineral rights? The issues are complex and date back to colonial times when Guatemala was first settled by the Spanish. The Spanish desired the fertile lands of the Mayans and moved them into the highlands less ideal for agriculture. Now, valuable minerals are the attraction. There is good news. The Mayan people are voicing their concerns to the government. They are speaking out about employment equality, social justice and land appropriation. I had the opportunity to meet with two senators of the Guatemalan government who are actively encouraging the Guatemalan government to address these land appropriation issues for the individual Mayan groups. 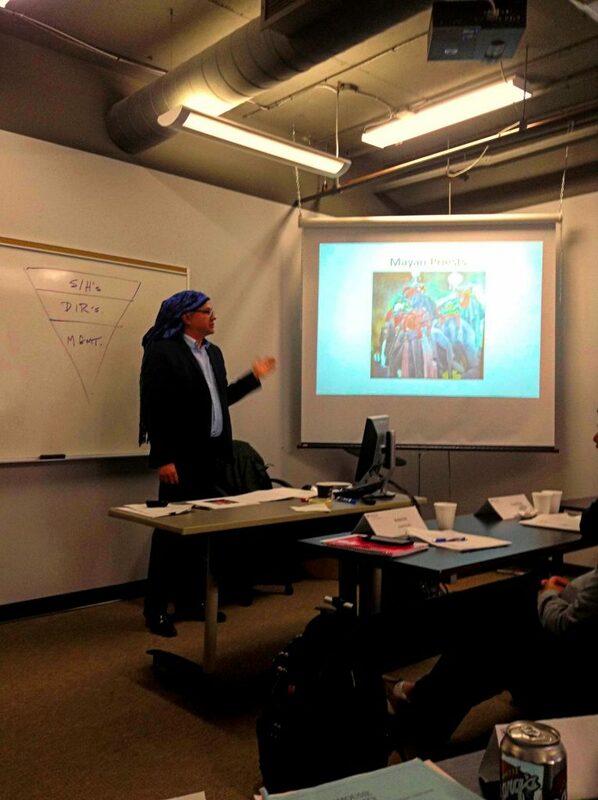 On my return to Canada, I used my Guatemala experience in a presentation for Professor Ray Klapstein’s Legal Course, MBA(FS) program. I discussed a legal case that is currently before the courts, involving a Canadian mining company and Mayan individuals who were injured and subject to abuse by security personal employed by a subsidiary of this Canadian mining company. The presentation was an opportunity to tell the story of the Mayan individuals and communities affected by mining. In so doing, I opened discussions with my MBA colleagues about complexities of operating within a different country and the ramifications and consequences of corporate decisions on indigenous communities. Professor Ray Klapstein reminded our class, “you need to get on the ground and find out what is going on and how it is impacting people which is a part of any good governance and risk management strategy of your organization”.